Recent media coverage will mean that many of you will be aware of the online “MOMO challenge” which uses several of the common social media platforms such as Snapchat, Facebook and YouTube. This online “trend” is potentially harmful to children and young people and we would encourage you to talk to your child about their online safety. 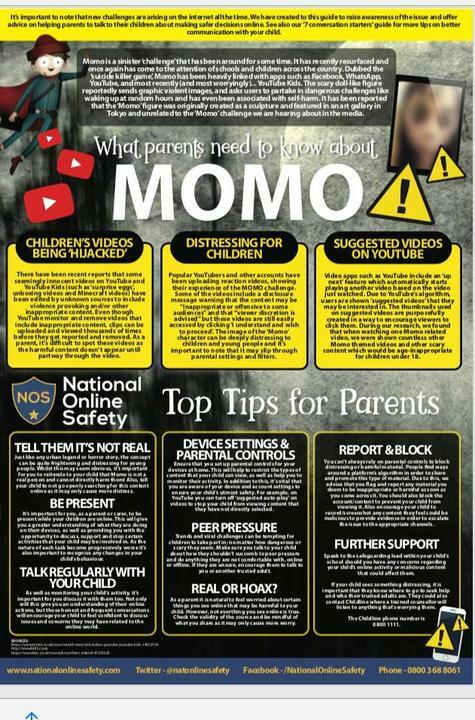 Please read the information below from Cumbria Police who have provided a guide for parents and carers which explains what MOMO is and how to ensure your child is not vulnerable online.